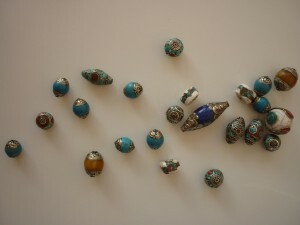 With different styles of craftsmanship from Afghan to Indian and Thai bead styles we have a small but succinct range of top quality beads. 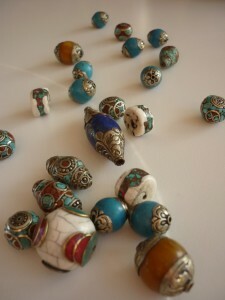 Each bead has its own distinct design and use different combinations of crafted red coral, turquoise, amber and cow bone to produce some truly remarkable eastern styles, which could be used on their own or with other beads to produce some stunning jewellery. 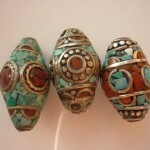 Beautifully crafted beads with distinctly Asian hand metalwork, setting a combination of red coral and turquoise stone produces a unique bead. Approx 12mm. A similar style to the beads above, but larger in size and elongated to produce a fine centerpiece that reflects the oriental style. 21 x 12mm approx dimensions. 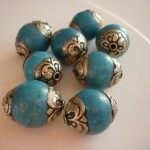 Crafted top quality plain turquoise from Afghanistan that offers an attractive marbling and intense colour. 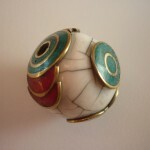 12mm approx diameter. 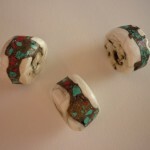 Red coral and turquoise set into bone using a glistening cement, then polished to produce a really interesting and different bead. 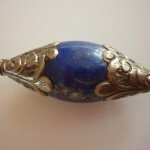 Featuring a sodalight that carries different shades of blue to create an enchanting stone bead. 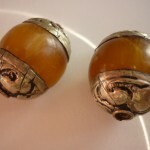 Gorgeous, golden amber set in ornate hand crafted stainless steel. 23mm (approx). 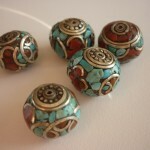 These large beads are beautiful and finshed to the best quality using the best Afghan turquoise and red coral, the set using a composite metal to produce a bronze polished finish.